Future can only be managed knowing the fundamentals that rule it. The Unicist Standard was developed to influence reality in order to make a “future” happen. 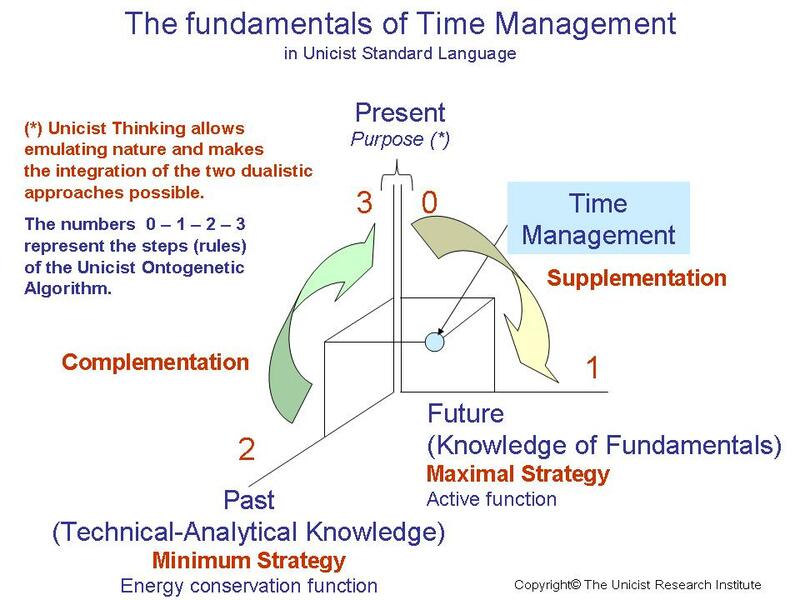 The “future” (fundamentals) drives action and the “past” (technical analytical knowledge) sustains the energy conservation. Maximal strategies are driven by the knowledge of fundamentals and minimum strategies are sustained by the technical analytical knowledge. Future scenarios, diagnoses, strategies and business organization are typical activities that deal with the future. As past and future are not symmetric, a different result can only be achieved if the fundamentals are managed. Fundamentals are, by definition, the functional description of the essences (the nature) of a specific reality and require an extreme effort of abstraction in order to “grasp” them. This abstraction is what we call unicist reflection which is necessary to apprehend the nature of something. The core of the reflection process is the confirmation of the hypothetical fundamentals with the necessary “pilot tests” which are real actions in the environment. 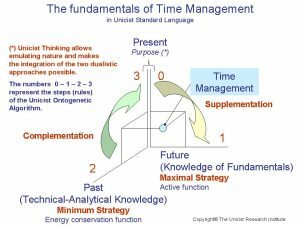 The Unicist Standard implies managing the fundamentals of reality to influence the future and having the necessary technical-analytical knowledge to deal with the present based on the past. It all begins with the knowledge of the fundamentals to find out if the desired future is possible. This is an extreme abstraction effort to deal with a non-symmetric solution. Only those who need to influence the future in their environment need to deal with fundamental analysis. This is a precondition to apprehend the Unicist Standard. Those who are used to working with the “benchmarks” of the past are threatened by this technology. They cannot deal with the innovation that is implicit in the future. 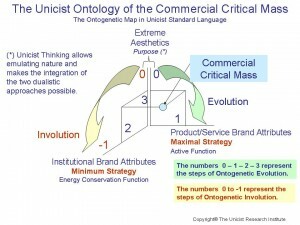 The market expansion of the Unicist Confederation is organized based on corporate and professional spin-offs. Corporate spin-offs are business units that are installed in companies to provide solutions for their markets and activities. The business units might be insourced or outsourced. The professional spin-offs are developed by partners that have a Unicist R&D business unit to research the adaptive aspects of businesses in order to develop diagnoses, strategies, architectures and install business platforms and business objects for end clients. 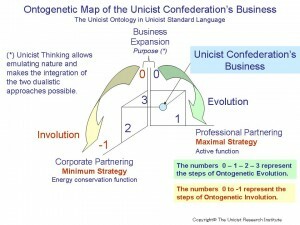 The Unicist Confederation is the business arm of The Unicist Research Institute, a pioneer in complexity science research that changed the paradigms in the business world. 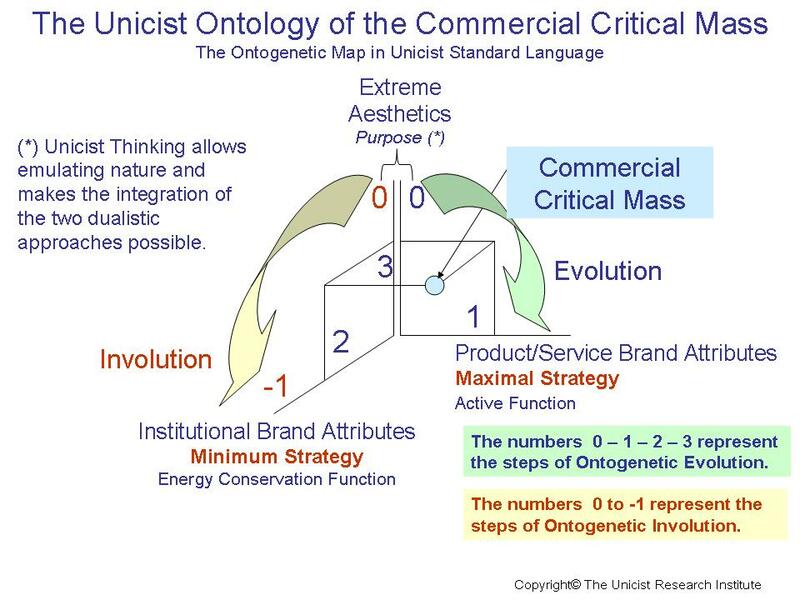 The core aspect of the commercial solutions of the Unicist Confederation is the development of additional distribution channels in a business, that work as “gravitational forces” on the rest of the channels.  The business objects for this development are provided by The Unicist Research Institute and the implementation is managed as a business unit until it is integrated in the organization. Before the Unicist Approach to businesses existed, 80% of the new businesses disappeared in less than two years. 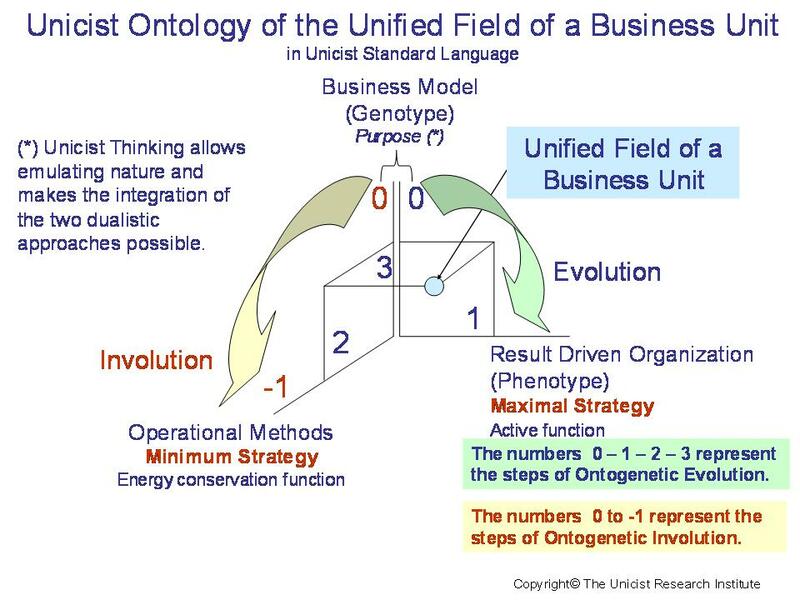 The Unicist Approach induced the possibility of managing the nature of businesses, defining the nature of the markets and developing business objects that accelerate business processes while they save energy. This provided a new starting point to launch successful businesses. “More than 500,000 companies are founded every year in the US and about 80% of them cease to exist within the next two years. This was the triggering cause to research what we named the “Butterfly Companies”. These companies took such name because of the beauty they have for their founders when they are born and their ephemeral life. As Sun Tzu said, “battles are won or lost before they are fought”, and the same happens in business. When a new company is created the success or failure has already been defined. This R&D e-book will be explaining why these “Butterfly Companies” are so ephemeral. It will drive you into the world of business viruses and how to build immune systems to avoid their damages. These companies are born with a deadly virus that needs to be cured as soon as possible. Consider that all the mistakes that are done when developing the company are not such: they are fallacies. And fallacies are extremely unconscious. Only the confrontation with results and groundings allows getting rid of them. This research showed the nature of butterfly companies and their cure. We hope you take your time to profit from it. 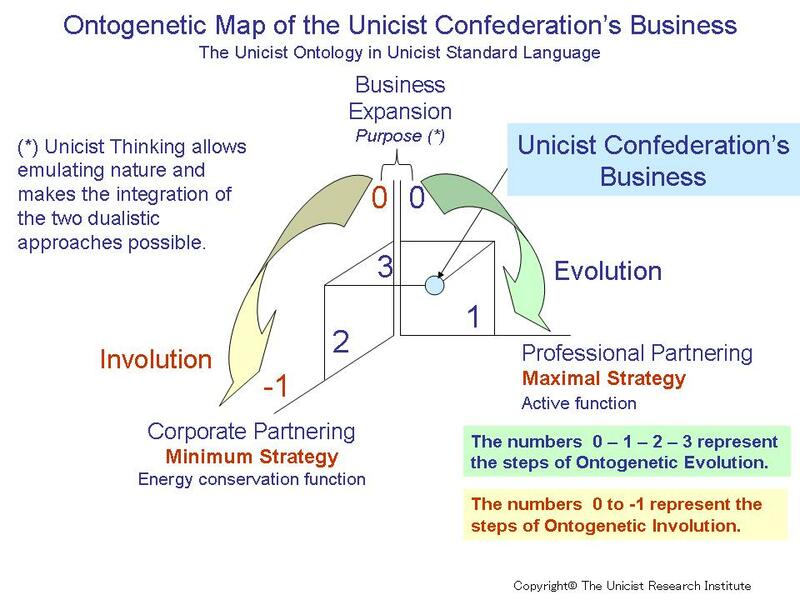 The concept of the Unicist Confederation’s Business is based on the integration of a maximal strategy developed through the Professional Partners Network and a minimum strategy implemented through the Corporate Partnering. Both aspects of the business are spin-offs but in the case of the Corporate Partnering the value proposition is direct and the results are immediate. On the other hand Professional Partners provide the maximal strategy by defining value propositions for end clients and ensuring the implantation of the unicist technologies to expand their businesses.  The business objects that are provided by TURI and the quality assurance processes developed with the support of the Blue Eagle X-pert System provide the “objective aspects” of the solutions to the users. These spin-offs imply that the clients are buying the implementation of business units to expand their business within special delivery conditions which include the sharing of the rights of the patents of the processes involved based on a partnering philosophy. 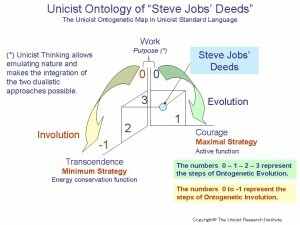 Steve Jobs passed away yesterday leaving behind a deed that is, and will be, multiplying worldwide. He will probably be remembered as the co-founder of Apple which, from our standpoint, is unfair. He is the person who introduced the user in the organization, giving true meaning to work. His search for transcendence, in the wide and not egotistic sense, allowed him to understand the needs of the community. He worked and organized the work to cover such needs. Courage was, without doubt, his guide in everyday work. He had to face “Goliaths” being a “David” and also had to overcome the “yes but” and “no” that innovators have to deal with. The prices he had to pay were extremely high. Apple was the vehicle for his innovations. It has to be considered that innovators without users have no added value. His creation allowed the integration of human beings with electronic devices. He is the true creator of the “phenotype” of computers and adjacent devices, which are their interfaces. The “window” he opened will never close. 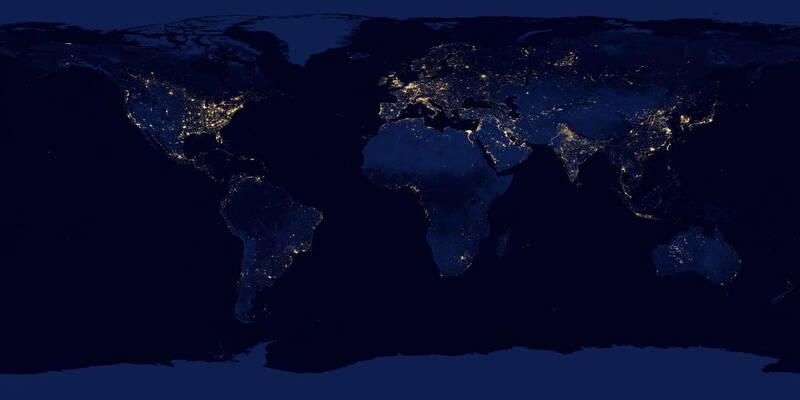 NOTE: The Unicist Research Institute was the pioneer in complexity science research and became the major research organization in the world in the field of human adaptive systems. More than 4,000 unicist ontological researches were developed since 1976 until July 2011 in the field of individual, institutional and social evolution. 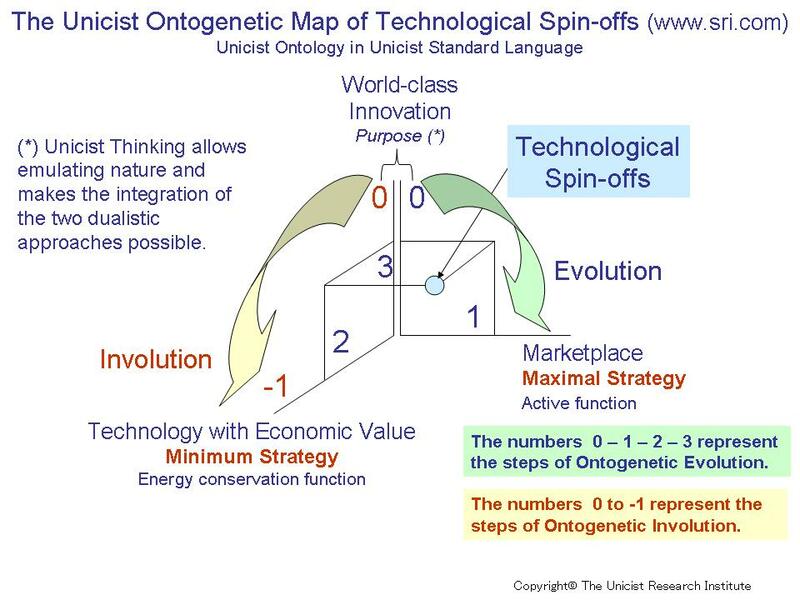 They included the development of the unicist ontogenetic maps (DNA) of institutions. Today we are launching the Unicist IT Business Platform to transform IT activities into business units including the use and development of business objects to increase the value added. The evolution of hardware and software widened the possibilities of information technologies to provide peopleware, in terms of work processes that allow increasing notoriously the value generation and the competitive capacity. 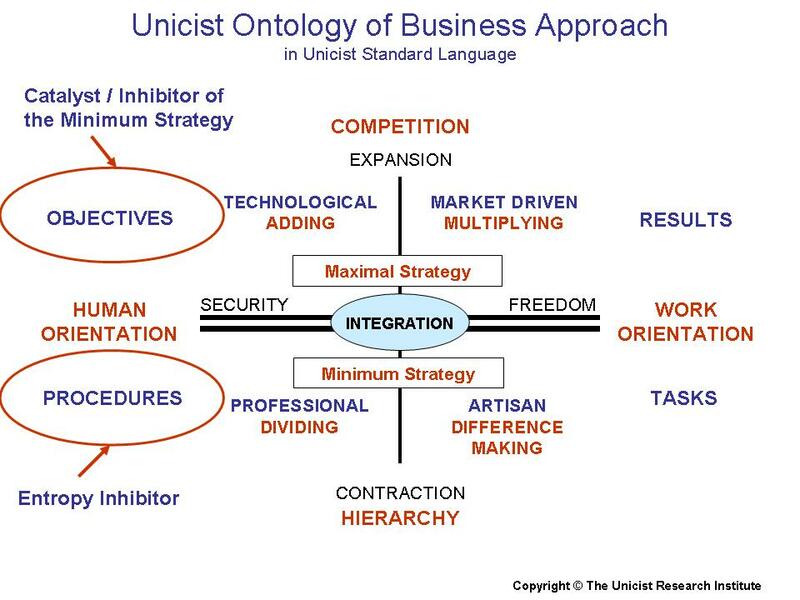 The unicist natural organization integrated with business objects allows upgrading the IT activities transforming them into virtual business units. The investment of the transformation is recovered within the first year. 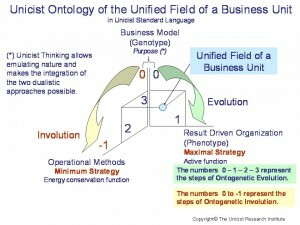 The research in the field of human adaptive behavior allowed having a complete set of ontologies and business objects to develop business growth. This triggers now the multiplication activities of the academic arm and the business arm taking advantage of the knowledge of the nature of cultural, institutional and individual behavior. Difference making businesses are those where the revenue is made by sales and profit is produced by the buying of what is sold (e.g. small retail businesses). Threat: lack of growth. Dividing businesses imply prevailing in the confrontation between something that exists and what is being proposed to buy (e.g. consultants). Threat: lack of credibility. Adding businesses are those where something is being built based on objective value (e.g. industrial businesses). Threat: commoditization. Multiplying businesses are those driven towards massive contagious expansion of the businesses (e.g. market driven businesses). Threat: inaction (nill). 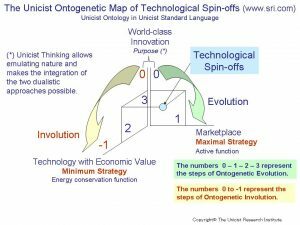 The Unicist Research Institute is the pioneering research organization in the field of human adaptive systems, which allows building a multiplying business based on the expansion of our partners’ network providing business expansion to the markets. Our business it to build businesses for our partners and their business is to build growth for companies. Time for multiplication has come. The nature of reality is described by the ontology that defines its functionality. 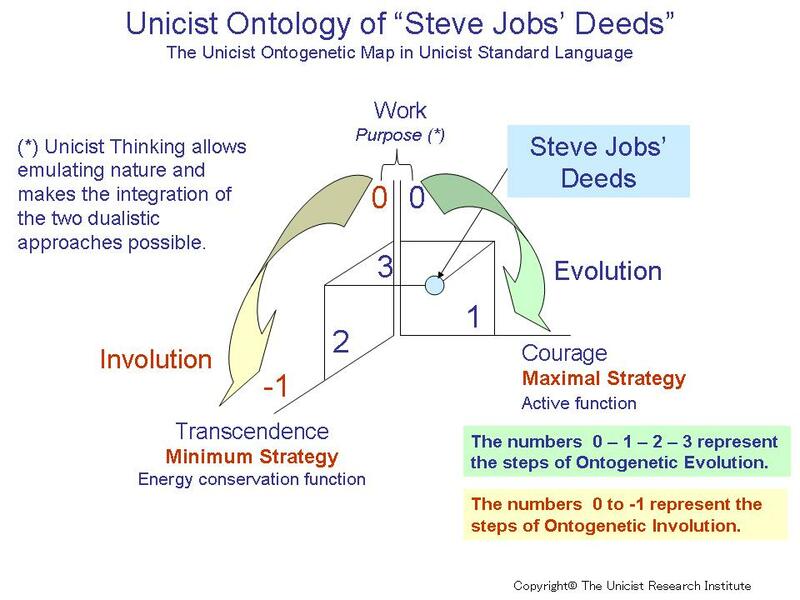 Therefore ontologies are timeless and cross-cultural. Strategy has its origin in military actions. Its etymology derives from “strategos”: the art of the general. Strategy has been applied to all uses where an influence needs to be exerted to achieve a goal. A strategic approach is a must when dealing with complex adaptive systems like businesses. The origin of the unicist ontology of Universal Strategy has been Sun Tzu, who has been the originator of a conceptual approach to strategy. Invincibility depends on one’s self; the enemy’s vulnerability on him. – Sun Tzu, The Art of War. c.400-320 b.c. 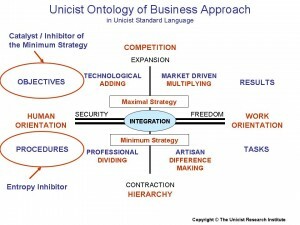 The concept described by Sun Tzu allowed defining the hypothesis of the ontology of strategy, and its multiple applications allowed confirming it. 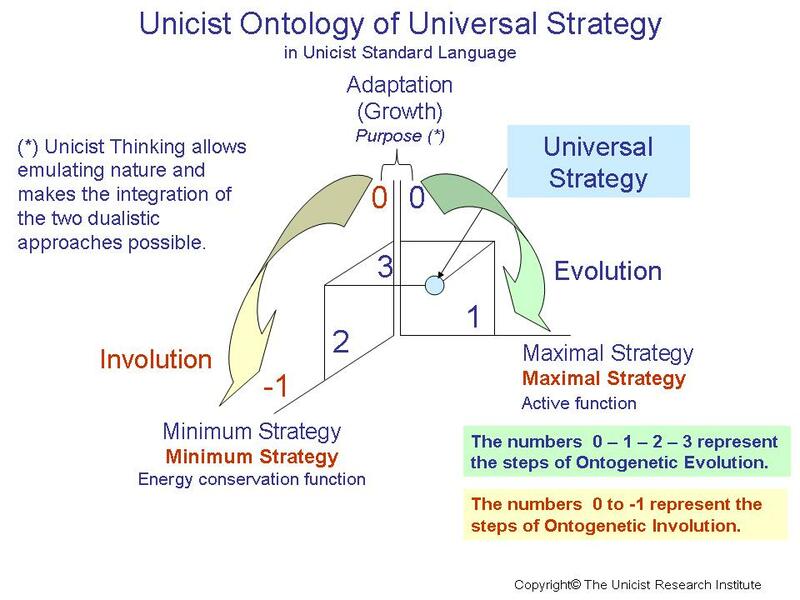 The ontological approach makes strategies understandable, reasonable and provable. If you are interested in managing the strategy of your activity we strongly recommend studying The Art of War. But you need to go beyond the operational meaning of his words and apprehend the nature of what Sun Tzu is saying.